The ID signals transmitted from the display are read by a smartphone* to relay a variety of information, such as traffic guidance or news about shops or products. The displayed content can also be provided in the smartphone owner's native language. * The smartphone must satisfy usage conditions, such as the OS version and camera performance. A special application must also be installed. The display unit is equipped with a USB Media Player function that supports Light ID signal transmission. Simply insert a USB memory device containing still or video images and the Light ID data into the display unit to configure a simple signage system. • A separate contract for a Light ID license (requiring a fee) must be concluded to configure a Light ID system. A Light ID can be individually linked to correspond with each content shown on the display. This allows more information to be delivered on a single display. A playlist can be easily produced using Multi Monitoring & Control Software (free). The playlist is stored in a USB memory device and inserted into the display unit (standalone type). The playlist can also be delivered to a number of displays on a specified, LAN-connected network, and easily rewritten (multiple device delivery type). Produced playlists are stored in USB memory. When the memory device is inserted into a display, the content is automatically played. Content is delivered from a single PC to multiple displays on a specified network. The content can also be rewritten. And data can be delivered according to a schedule. • Synchronized playback is not possible. This stylish design blends in with surrounding spaces and fills the screen with images. 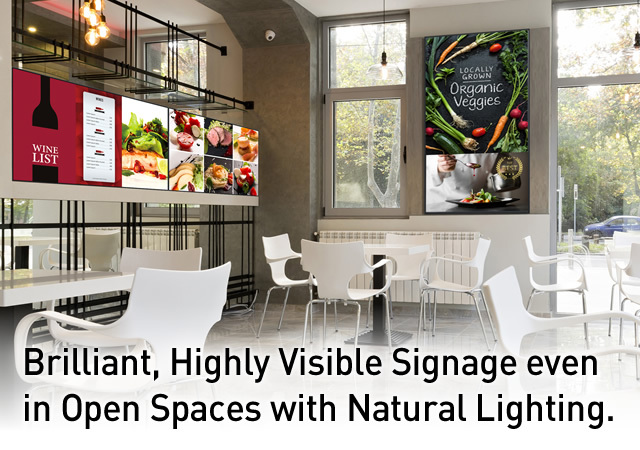 Since the SF1H Series blends in with almost any surroundings and the screen is nearly filled with images, this display has a powerful, eye-catching impact. The SF1H Series is designed for use in either portrait or horizontal orientation with no effect on panel color and lifespan, further reducing TCO. A tilt installation up to 45 degrees forward or backward is also possible. The angle can be adjusted for easy viewing when installed in a high location. * Angle adjustment is not possible for forward/backward tilting installation. Be sure that the Power Indicator comes to the downside. The use of highly durable panel materials and quality electronic components ensures dependable 24-hour operation seven days a week. This makes the SF1H Series ideal for installation in public places, surveillance centers, and other applications where absolute reliability is critical. Using DIGITAL LINK makes it possible to transmit video, audio and control signals over a long distance (up to 150 m (492 ft) with a single LAN cable. *1 Easy cabling also reduces labor during setup. This provides transmission of high-quality images and sounds, as well as remote control. *1: When connected with the [Long reach] mode, the maximum transmission distance is 150 m (492 ft). In this case, the unit can receive the signals of up to 1080/60p. A CAT5e (STP) cable or higher is required. You can easily copy the setting data of a master display to other displays using USB memory. This saves labor when making screen settings during the installation of multiple devices. * If the inch sizes/series for the displays differ, the cloning function does not operate. Use common inch sizes/series. The SF1H Series is equipped with a variety of signal input terminals : two HDMI, DVI-D, DIGITAL LINK, and USB. If the main video and audio signals are interrupted, the system immediately switches to alternative signals. This makes it ideal for mission critical control rooms and surveillance centers. If the main signals are restored, the original image is displayed. :Selectable for both Primary and Secondary. : Selectable for either Primary of Secondary. 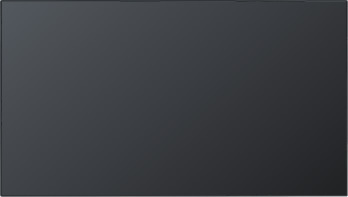 * [COMPONENT] may be displayed as [RGB] depending on the settings of [Component/RGB-in select]. For more information, see the operating instructions. 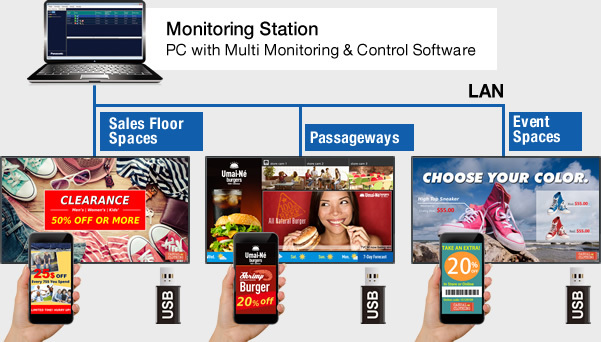 This free Panasonic software enables you to monitor and control up to 2048 devices over a LAN network from a single PC. As a monitoring function, the status of multiple devices can be listed in groups, and then detailed information on each device can be separately displayed. As a control function, control commands such as power ON/OFF, input switching and command inputs can be executed, and a schedule function can be used. The SF1H Series support Early Warning Software (optional: ET-SWA100), which monitors the status of devices (projectors or flat-panel displays) connected to an intranet, reports device failures, and gives advance warnings by detecting predicted abnormalities, after installation to the PC has been completed. The status of displays in an intranet is observed, and problems are forecast, the occurrence of other problems is sensed, and notification is sent to the user.